Driving around Slievenalargy looking for a place to park I spoke to a couple of people on the minor road that skirts to the south of the hill. They told me I could park at the quarry at J305354 A, and cautioned that I should let the occupants of the house on the lane leading to the quarry know. A good minor road starting at J307352 B leads up to the quarry. There was no one at the house when I called. I parked at the quarry anyway, and I left a note in the window of my car with phone number in case there was a problem. I climbed up to the left of the quarry and picked my way over rough ground to the NW. Fences criss-cross the hill, and I was able to pick up a small trail leading across the hill in the direction of the summit. While Slievenalargy may be one of the quieter Mournes hills, with little evidence of many visitors, it did hold a pleasant surprise in store for me. At approximately J299356 C I discovered a Mass Rock, inscribed with chalice, crosses and the letters ‘IHS’. It was a large block of granite, perhaps 3 feet high and 4 feet wide. It sat nestled between two areas of higher ground, and the views across to the Mournes from it were stunning. It was strange to think it had probably sat here for hundreds of years, and that it had once attracted so many people in secret onto this hill. Now hundreds of years later I was following in their footsteps, for a different reason, but seeing the same views. Letting go of the past I continued on to the summit area, which involved crossing a couple more tricky fences. The top is heathery with a sprinkling of rocks and boulders. The best view is towards the main Mournes, with Slieve Bearnagh, Meelmore and Meelbeg looking fantastic from this angle. Lough Island Reavy Reservoir sparkled just below the hill, and my eye was drawn northwards where I saw distant hills and Lough Neagh. I retraced my route back to the quarry, pausing once again to admire the Mass Rock. 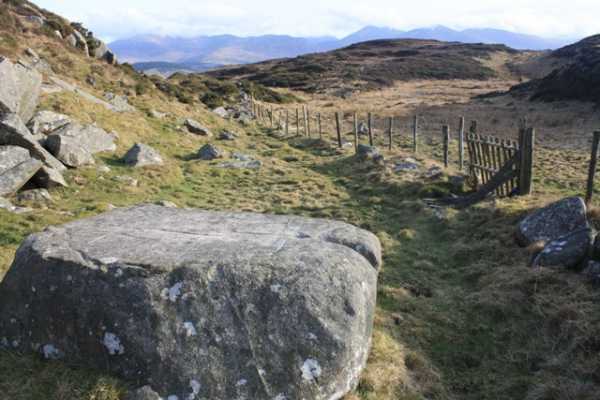 As I moved on, the Rock continued its quiet existence, sitting peacefully in its hidden spot, with the knowledge that it will remain largely unvisited because of its location on this quiet hill.